Unhappy about the quality of your digital image enlargements? Resize your images using BenVista PhotoZoom Pro 3, and get superb results through our unique, award-winning S-Spline technology! Equipped with S-Spline Max, the latest generation of BenVista's patented S-Spline algorithm, PhotoZoom Pro 3 creates image enlargements of unequalled quality. PhotoZoom Pro 3 beats any of the alternative solutions, such as Photoshop's Bicubic technique, fractal-based methods, and so-called 'industry standards'. Where competitors fail to get past 300000 by 300000 pixels (or even much lower), PhotoZoom Pro 3 enlarges images up to 1 million by 1 million pixels. No other product offers this capability, let alone with preservation of image quality. BenVista does not intend to dictate how you should fit PhotoZoom Pro 3 into your workflow. Therefore, the software works not only as a stand-alone application, but also as an Automation plug-in and Export plug-in for Photoshop. Although S-Spline Max has proven to be the optimum technique in most tests, PhotoZoom Pro 3 also offers two other excellent S-Spline techniques. You can choose which you like best. You can even fine-tune each technique to your personal liking, and save your favorite settings so you can use them again later. PhotoZoom Pro 3 perfectly meets the requirements of the professional user when it comes to image support. It fully supports color spaces like RGB, CMYK, Grayscale and Lab, just like metadata of the types EXIF, IPTC, XMP, and ICC profiles. Also, PhotoZoom Pro 3 supports layers, 16 bits/channel (including Raw) and 32 bits/channel (HDR) images and, last but not least, a very wide range of image file formats. PhotoZoom Pro 3 is the ideal solution for enlarging digital images, both for printing and on-screen purposes. Besides enlargements of unequalled quality it offers various professional functions and features, and can be easily fit into anyone's workflow. 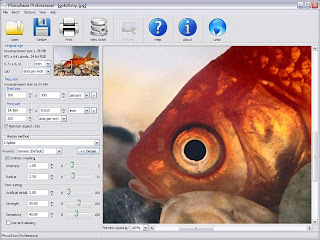 PhotoZoom Pro 3 is an absolute must-have for both professionals and serious amateurs who want to resize their images.